85 search results for "Marcia Sakai"
A blessing and dedication was held today for the University of Hawaiʻi at Hilo new Sciences and Technology Building. The $25 million building, spans more than 42,000 square feet and fulfills the need for additional classrooms, office space and new state-of-the-art laboratories for UH Hilo’s expanding physics, astronomy and chemistry programs. Key features include an auditorium that seats in excess of 140, along with smaller rooms of 60 and 24 seats. In addition to the tenant programs, the building’s facilities will accommodate classes in biology, math, geography, history and communication. Based on projections, the building will serve more than 1,700 students in various classroom venues daily. UH President MRC Greewood (r) attended the event. 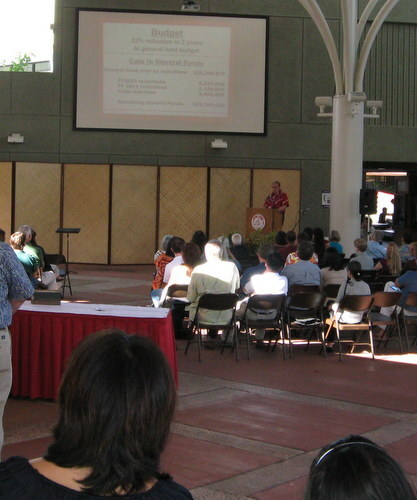 The event was attended by a host of elected state, county and university officials, including Governor Neil Abercrombie and UH President M.R.C. Greenwood. Abercrombie’s appearance marked his first official visit to UH Hilo since being elected governor last year and underscored his support for Science, Technology, Engineering and Math (STEM) education and professional workforce development in Hawaiʻi. 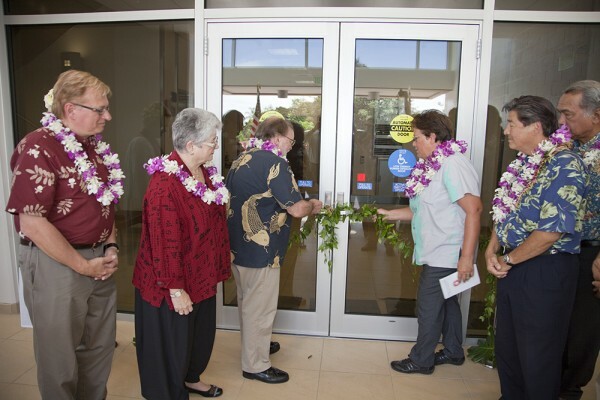 Governor Neil Abercrombie and Senator Malama Solomon untie the maile at the doors of the new Sciences and Technology Building during today’s blessing ceremonies. (L-R) UH Hilo Chancellor Donald Straney, UH President MRC Greenwood, Gov. Abercrombie, Sen. Solomon, Rep. Jerry Chang, and Sen. Gil Kahele. Photo by Robbyn Peck. The University of Hawai‘i at Hilo’s Strategic Planning Committee* announced today that Chancellor Straney has accepted the final draft of UH Hilo’s 2011-2015 Strategic Plan. The chancellor will outline processes to support its implementation at the start of the fall semester. The plan will be sent to the UH system Board of Regents this coming academic year. The plan was endorsed by the three governance/advisory bodies represented on the Strategic Planning Committee: Faculty Congress, Hanakahi Council, and UH Hilo Student Association. From those people who completed the endorsement surveys, there was an indication of 88% endorsement from faculty and staff, and 84% from students. The final draft is the culmination of many months of work and significant input from UH Hilo stakeholders. The Strategic Planning Committee’s final progress report summarizes the activities of the committee and next steps on approval and implementation of the plan. 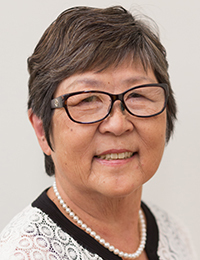 Learn more about Interim Chancellor Marcia Sakai and her work on the Office of the Chancellor website. 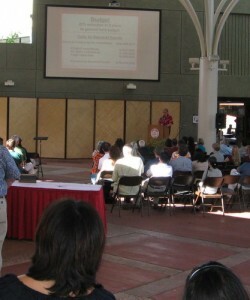 Chancellor addresses faculty and staff at the 2011 Spring Gathering held at the Campus Center Plaza. Aloha and welcome to the 2011 Spring Gathering! Thank you all for coming. Jean, thank you for that kind introduction. Aloha Chancellor Yamane and our distinguished guests from Hawai‘i Community College, UH Hilo Faculty, Staff, and Students. Welcome to our 2011 Spring Gathering. Thank you all for coming. Thank you, Kalani Makekau-Whittaker and the staff and students of Kīpuka Native Hawaiian Student Center, for opening our gathering. Thank you, Matt Howell and the Kāpili Choir, for the beautiful singing. I look forward to hearing more songs later in our program today. Today I’d like to share with you my thoughts about UH Hilo and what I discovered during my first six months. I’ll also share some latest news from our colleges and elsewhere around campus. The choir will sing again and then we’ll introduce our newcomers. I’ve just completed my first semester as chancellor at the University of Hawai‘i at Hilo. It’s been an extraordinary learning experience, and I’ve found a good deal to admire about our university. I’d like to share a few of the attributes I’ve discovered about UH Hilo that give us a competitive edge in the higher education marketplace. I think UH Hilo is an incredibly strong university. We’re blessed with very high quality faculty who could work elsewhere but choose to work here. The faculty is providing a very high quality education to our students. Our dedicated staff also contribute greatly to our success. When I first arrived, I started asking questions. I zeroed in on three basic questions—both on campus and off. I visited with departments and faculty to talk with you about these and other areas. How can we help students learn better and graduate faster? Seems obvious, but it is an active effort. Graduation rates can be significantly improved. We need to graduate more than one in three students in six years, but we need to do it in a way that maintains the quality and standards of our programs. How do we make work more satisfying for the members of our university ohana? What are the road blocks, how can we streamline, improve communication and morale? We’re holding a series of workshops with faculty and staff to solicit recommendations for improvements, looking at the ideas that have emerged, and making plans to implement them: Streamline signatures, improve communication, provide shuttles, and more. Finally, how can we benefit the whole island and state? Hilo is in our name, but Hawai‘i is under our feet. We and Hawai’i Community College are the only sources of higher education on this island. We need to take a 2+2 approach to curriculum development, together with Hawai‘i Community College. The strategic planning process is well under way. Consultation with the campus on the draft mission and vision statements is in process. The Strategic Planning Committee does not view the initial drafts as definitive. The committee really wants your help to refine them. I want to share with you what I see as some of the key elements that distinguish UH Hilo. UH Hilo has a number of great comparative advantages. Our small classes are a key advantage. They allow students to have the personal attention of PhD faculty who are active scholars in their fields. Our faculty regularly collaborate with students on research and service projects. I think of UH Hilo as a “practical university,” one that prepares students well for meaningful and productive careers here at home that will help build our island economy and strengthen our island communities. Our island is the best place in the world to study environmental and marine science, astronomy and volcanoes, sustainable agriculture, Hawaiian studies and Indigenous language revitalization, conservation biology, and many more subjects. There is a strong “sense of place” in these fields, and they all present opportunities for our graduates to make lifelong contributions to their own communities and help build a prosperous future. In fact, everything we do has a strong sense of place. How do we know this is a Hawaii university and not just a university in Hawai‘i? We are grounded in a strong sense of place where the culture and language permeate and strengthen everything about the way we live, teach and learn. We are building a vision that will not only be Hawaiian in name but in the context of how things are done on campus. You can see this in our greatest areas of potential: Rural Health, Environment, Energy, Agriculture. UH Hilo is more than an institution of higher education, it’s a major economic engine for our island and state. A recent estimate is that UH Hilo contributes about $240 million to the economic activity of the state. We employ 610 people and stimulate an additional 3,900 jobs in our local communities. 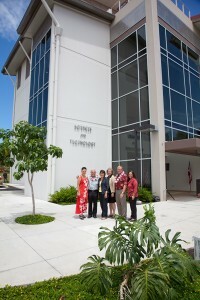 UH Hilo’s University Park of Science and Technology: represents $900 million in investments and creates about 400 jobs. For this spring, the enrollment trend at UH Hilo continues upwards, as it has for the past twelve years. This spring semester, we have 2.5% more students than last spring. Agriculture, Forestry and Natural Resource Management is working on developing a training program in alternative fuels. The plan is for an extraction mill to do double service as a feed production mill. An ethanol production training facility is also envisioned. Arts and Sciences is delighted to welcome its first Droste Distinguished Visiting Research Fellow of Art, Dr. Cathryn Shine, from the University of Canterbury, Christchurch, New Zealand. Cathryn, can you please stand and be recognized? At the University of Canterbury, Dr. Shine is the coordinator of Studios for Photography and Printmaking in the School of Fine Arts, and current director of the Pacific Rim International Print Exhibition. Dr. Shine is here for six weeks. While at UH Hilo, she will engage in research and teach a special topics course, Lithography and Studio Open Forum. She also will give a public presentation that will address aspect of her scholarship and the ongoing significance of the Pacific Rim exhibition. The Droste Distinguished Visiting Research Fellow is an initiative of the Art Department and is made possible by the generous bequest from Howard and Yoneko Droste. Business and Economics is planning for the refurbishment of UCB 114 for distance learning capacity. The college is working on a soft launch for Fall 2011. Also, UH Hilo, through the College of Business and Economics, is now on the US News & World Report’s “Best Business Program” list. Hawaiian Language celebrates two doctorates in Hawaiian and Indigenous Language and Culture Revitalization that were presented at fall commencement. The honors went to Katarina Edmonds, a Maori educator from New Zealand, and Kauanoe Kamanā, the first of Native Hawaiian ancestry to receive the PhD awarded by Ka Haka ‘Ula O Ke‘elikōlani College of Hawaiian Language. Pharmacy will graduate its first class of student pharmacists this May and full accreditation is expected in June. As you know, the fiscal situation in state government is challenging. Governor Abercrombie said in his State of the State address, “the canoe could capsize,” and “we could all huli.” State government needs to make up an $844 million shortfall in the next two and a half years. We have not seen as big a rebound in the economy as we had hoped for. In addition, all state programs are stretched and under resourced. As our economy recovers, we should see an increase in revenues to the university, but we will be in this condition for a while. UH Hilo is proactive in generating some of its own resources. I’m extremely pleased to see how hard our faculty and staff work to pursue and implement extramural grants. We have the total for last fiscal year ending June 2010, and it’s the highest ever: $27 million. 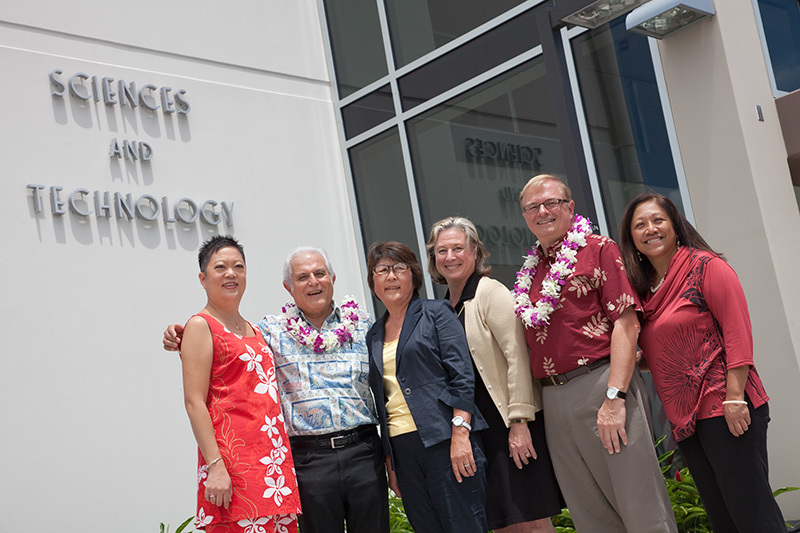 This year’s numbers reflect the College of Pharmacy’s Beacon Community Grant $16 million to support health information technology on the island of Hawai‘i. Private fundraising results have settled back down after the Centennial Campaign ended in 2009 with $6 million total. Considering the state of the economy, our fundraising is fairly successful, at $3 million for the year, and we’ve begun to prepare for a new capital campaign. 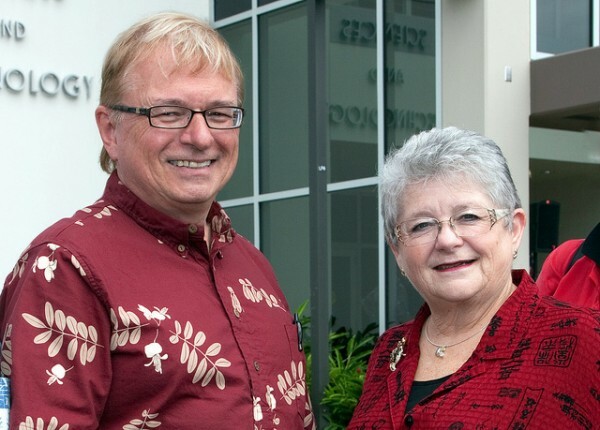 Our largest bequest in the history of UH Hilo came last year from retired UH Hilo faculty members, Howard and Yoneko Droste. This generous $810K gift will be used to support the work of the art and English departments. It also sends a powerful message to other potential donors that the faculty at UH Hilo believe enough in our programs to contribute themselves. Last year, we launched a Scholarship Matching Program, leveraging an earlier $1 million donation toward scholarships. By last July, we had created a total of 22 new scholarships. However, we are dealing with a 22% reduction over the last two years to the general fund budget. Even with increased student demands, we are trying to protect our instructional core, offer needed classes, keep class sizes small, and serve and support our students and faculty as best as we can. We have been doing a great job of handling the combination of budget reductions, large enrollment growth, and balancing the various competing needs of the campus. We’ve reviewed our budget mid-year, as we always do. We have also done projections through year end. We will need to make some further adjustments to ensure we can fulfill our academic plan for the year. As always, we also need to make sure we end the year in the black. The governor has not yet released our fourth quarter budget. So we not only have to continue to be cautious but need to be prepared to possibly respond to additional budget reductions. We will have to face some additional decisions and may have to defer some expenditures and some hiring. We need to take advantage of every means at our disposal to generate revenue: extramural grants, fundraising, and working with the system to maximize income. For example, we can make sure we achieve the benchmarks proposed by the UH System to the legislature. If it’s enacted into law, this model would allocate funding to the campuses in the next biennium based on achieving some of the system’s strategic outcome measures. Under this model, enrollment growth in undergraduates who are residents of Hawai‘i will increase revenue. Such growth should fund increased instruction. We also need to achieve the system’s targets for the number of degrees and certificates we award. Of course, we need to go about meeting these targets without compromising academic quality, and I am confident we can do it. Our Enrollment Management Implementation Team, which is made up of members from both academic affairs and student affairs, is coordinating our response as the UH System prepares to transition into this performance-based budget formula. Our beautiful new Science and Technology Building has taken full shape and is nearing completion! Astronomy/physics and chemistry departments will move into the building. With $28 million in funds released by the governor last year, we will break ground on the award-winning College of Hawaiian Language building on February 12. It will be a grand celebration. I say award-winning because the Honolulu chapter of the American Institute of Architects gave WCIT Architects the design award for this building in the “Commissioned Work to be Built” category. The building and landscape will reflect Hawaiian culture and Big Island natural resources. I hope you’ll join us for the groundbreaking at the Nowelo Street site Saturday, February 12. This concludes this portion of the program, thank you for your kind attention. Under the direction of Assistant Professor of Music Matt Howell, the Kāpili Choir performs at the 2011 Spring Gathering held at the Campus Center Plaza. Thank you for the beautiful singing. We are pleased to introduce our newcomers. Thank you to all the hard work of the search committees. I’m impressed with the caliber of our new faculty and staff. Kenny Simmons has kindly agreed to serve as interim vice chancellor for academic affairs. Kenny, if you could please come forward. Most of you know Kenny. She is a professor of English, former humanities division chair, and has served as assistant vice chancellor for academic affairs for the past several years. I’d like to express my appreciation to Kenny for agreeing to step in. On behalf of our campus, I’d like to extend a warm welcome to all our newcomers. Thank you Chancellor Yamane and leadership at Hawai‘i Community College for joining us. I look forward to collaborating with you to improve higher education opportunities on our island. Kalani Makekau-Whittaker and the staff and students from Kīpuka Native Hawaiian Student Center. 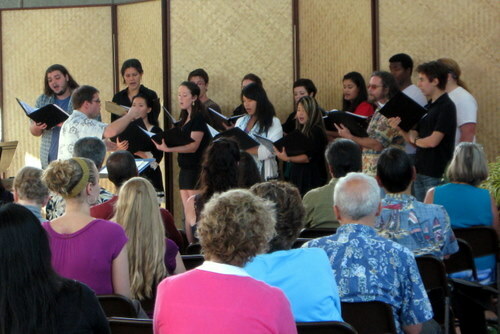 Matt Howell and the Kāpili Choir. Bridget Awong and staff at Sodexho. David Scott for running the sound and PowerPoint. Thank you, everyone, for joining us today. We have a number of challenges ahead, but I truly believe we’ll be able to do a lot to advance our university this year. But for now, let’s get to know one another better over refreshments. Please take the time to reach out to newcomers and welcome them into life on campus. Have a productive spring semester! And now the Kāpili Choir will sing one more song as we conclude our program.